Congratulations to Blanche Beeston 8GC who won her first ever rowing regatta event at Evesham, in the WJ13 double scull class in 3 rounds, competing for City of Bristol Rowing Club. We would like to take this opportunity to remind parents, carers and students that nose studs are not permitted under our school uniform rules. To enable us to be fair and consistent any student wearing a nose stud to school will be asked to remove it immediately however newly pierced it is. Thank you for your support on this matter. This coming week is Mental Health Awareness Week. We will be raising the awareness of this in assemblies and tutor times next week, thinking about why taking care of your mental health is so important and ways in which we can do this. In particular, we will be focusing on mental health issues that are most prevalent in our school community - depression, exam anxiety, social media anxiety, and introducing the concept of self-care. Attached to this mailing is the link to the assembly presentation that students will receive to kickstart this week of important discussion around mental health. Following the success of the cultural diversity social evening last year, we would like to organise another event this year on Thursday 19 July, to celebrate our school’s diversity. Come and help us plan the event on Wednesday 6 June in the School Library at 6pm. If you would like to be part of the planning group please email kellym@cotham.bristol.sch.uk or click here to view the flyer. GCSE Exams are now underway. Year 11 will start to sit the majority of their GCSE exams from Friday 11 May. The Leavers’ Assembly finishes at 12.30pm on Thursday 17 May and Year 11 will leave the school site at this time. Lunch will not be available on site for Year 11. A small number of students will sit their Computer Science exam at 1.45. From Friday 18 May to Friday 25 May, all teachers will continue to teach their classes in any subject for which the examination has not been completed. We would strongly encourage your child to attend as many of these as lessons as possible. If you and your child believe that they would benefit more from completing independent revision at home and will not attend school, please contact the school using either the online School Absence form or the absence line 0117 919 8019. If we do not receive notification that your child is not going to be in school on one of these days then normal absence procedures will apply. From 4 June, there will be additional examination preparation sessions available; we will write to you again before Friday 25 May to confirm which session(s) your child should attend. When not in school, all students should be revising carefully at home. If your child is unable to work at home, they may choose to study in the school library. In order to do this they must collect a Library pass from student reception each time they come onto site. Students must abide by Library rules and work on their own in silence. For safety reasons students must sign in and out at the student entrance when they come onto the school site. When on site pupils must wear school uniform and follow normal school rules. All library books must be returned by Friday 29 June at the latest. Students have been asked to return library books as they finish with them during the examination period. Students must take books to the library and not drop off at reception. If there are any queries over books pupils must contact Ms Southall the librarian at daviess@cotham.bristol.sch.uk. Invoices for outstanding books will be issued from Monday 2 July. Pupils have been issued with their own personal final examination timetable showing their own GCSE exams and examination board rules. No further paper timetable will be issued and it is important to keep this information safe. Please ask your child for this information if you have not seen it. An electronic version of their timetable will be added to the Year 11 Google classroom page so that students can obtain another copy. Student ID cards will be needed to gain access to the school and to confirm identity with exam invigilators. Students must be in full school uniform for each of their exams. Please remind your child to bring all necessary equipment to examinations, including a functioning calculator. Results will be available from 10am to 12noon on Thursday 23 August from Charnwood. Results can only be given to pupils. Permission for someone else to collect results must be supplied in writing before the end of term (20 July) and proof of identification provided on the day. This week has been "Wellbeing Week" with a focus on Post 16 Student Mental Health. We had Creative Youth Network come in to speak to the Year 12s in Core Programme about the wellbeing services they offer followed by a mindfulness session run by one of our Academic Mentors. The Wellbeing drop in lunchtime session continues on a Thursday lunchtime in G104 - all are very welcome. This week we focussed on CBT techniques. Unfortunately there have been several bike thefts from the RGS sheds this week - please ensure that your son/daughter secures their bike to a post with a strong, secure lock. Year 13 leavers assembly is on Friday 25 May. This week’s Artwork of the Week goes to Eva Brennan, 9SME, with her wonderful mixed-media page inspired by cubism. Click here to view. On Friday 4 May Year 7 and 8 German students had the opportunity to watch a play delivered 100% in German. Students really enjoyed the humour and slapstick comedy, and it proved to be a really motivating learning experience. There was excellent participation from students throughout. Click here to view images and a short video of the event. 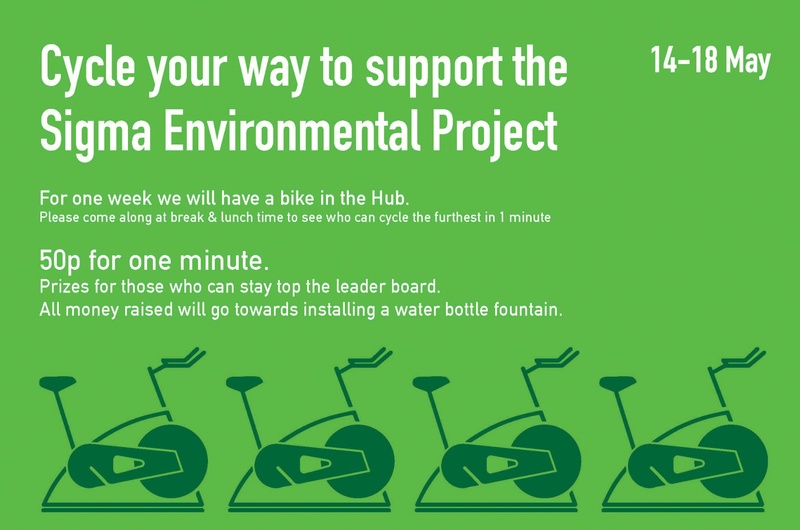 Cycle your way to support the Sigma Environment Project. For one week 14 - 18 May, we will have a bike in the Hub. Please come along at break and lunch time to see who can cycle the furthest in 1 minute (50p for one minute). This year’s Foster Care Fortnight runs from 14 to 27 May. It is the UK’s biggest foster care awareness raising campaign, delivered by the fostering charity, The Fostering Network. Bristol City Council’s Fostering and Adoption Service is organising a range of events during the fortnight. Click here to find out more. QEH are hosting a conference featuring a series of trailblazing speakers - women who have led the way in their field. The headline speaker is Anita Corbin whose work with Sunday TImes and the Observer Magazine has taken her on assignment all over the globe. Also speaking will be the former Captain of the World Cup winning Women’s England Rugby Team Maggie Alphonsi MBE, The Deputy Leader of the Green Party Amelia Womack and Derek Thomas MP. There will be a series of sessions on the day designed to tackle specific issues facing girls today, including ‘Building Resilience’, ‘Developing Your Leadership Style’ and ‘Creating Eye-catching Applications’. All girls aged between 14 and 18 are invited to attend. To register a place please email events@qehbristol.co.uk or visit the website here.